Mindfulness in Movement is an Austin and Dallas-based practice teaching the Alexander Technique, a gentle method for learning to recognize and change habitual body postures and movements to relieve and prevent tensions, stresses and pain. Research published in the British Medical Journal found the technique can significantly reduce symptoms of chronic back pain and provides longer term benefits compared to conventional treatments, such as massage, pain killers or exercise alone. A pain management study at the University of the West of England Bristol found more than half of participating patients stopped or reduced their medication within six one-to-one Alexander Technique lessons with a qualified instructor. The technique is also widely taught in the performing arts. Musicians, dancers and actors use the technique to improve performance and avoid injury. Many world-renown performing art schools teach the technique as part of their coursework, including the Juilliard School in New York, the Royal College of Music in London and the American Conservatory Theatre in San Francisco. Mindfulness in Movement’s private lessons can benefit people of all ages and backgrounds. 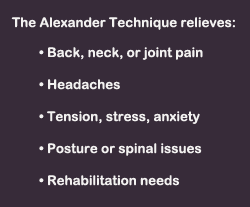 Whether you are someone looking to perform everyday tasks, such as sitting, standing and walking, without pain or a performer preparing to take center stage, anyone can benefit and improve their quality of life from learning the Alexander Technique. Individual lessons are offered in 50-minute sessions ($75) or 30-minute sessions ($40). A 90-minute introductory group lesson is also available for a maximum of three people, please contact us for costs. See the Lessons: What to Expect section for more information.